Can you recall the best meal that you had this summer? Was it just because of the taste and items on the menu? If you are like us at Cooke Furniture, you know that the ideal meal also demands those elements above and beyond the ancillary food items. The optimal meal also has an unforgettable venue and ambience. Most importantly, it includes the most important people in your life. Cooke Furniture has systematically created the perfect dining experience with its Cooke Furniture Dining Tables. They were designed from the ground up to create that ideal dining experience that we thought were just the legends of old. Our ancient ancestors never knew it any other way than to eat their meals outside. They also seldom experienced a meal without the perfect ambience created by the glimmering light of the stars and paired with the flames and shadows cast by their meal fires. The food was steeped in the terroir of the surrounding habitat. Thousands of years later, we are a far cry from this setting with our quick meals and inattention to details. Although, we can draw on some of the highlights from these days of old with the help of a Cooke Furniture Fire Pit Dining Table. Cooke Furniture has engineered fire pit tables for dining and creating the memorable family time that ensues. When a family is able to set down and eat together, it is a special time. Cooke Furniture Fire Pit Dining Tables make this time easy to experience all of the time. It creates a classic and memorable situation in your family’s backyard that will keep all of the members of your family asking to dine outside every night. The roundtable nature keeps your family engaged in close proximity and stimulates conversation for long after other settings would have the members of your family running to their next activity. To read more about how round tables keep your family and guests engaged in conversation you can read our other post on 5 Essential Tips For Entertaining Guests. This family experience is best had now, in the midst of the perfect summer weather. The kids are gearing up for school, but summer is not over yet. The weather is perfect and so are the nights for sharing a meal under the stars. The flame at the front and center for your family dinner is perfect as well, even with the heat emitted. 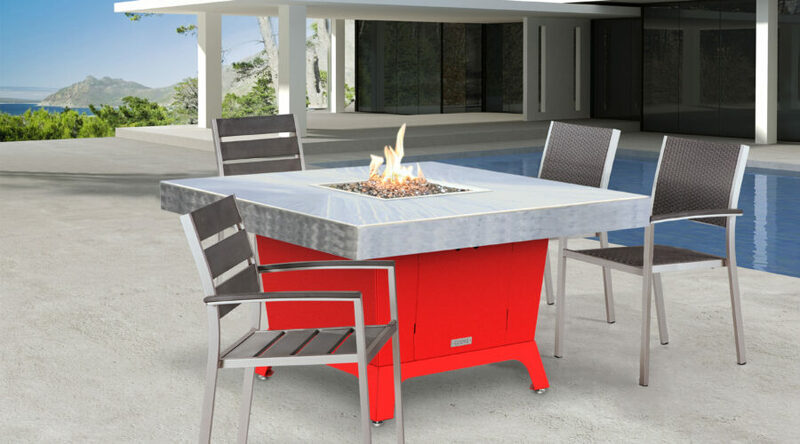 Cooke Furniture Fire Pit Dining Tables feature a glass shield which limit the exposure of heat for those warm nights and make the flame more of decorative accent to your dinner conversation than a heat source. Cooke Furniture is truly the only Fire Pit designer which has a table perfectly engineered to create the perfect dinner for your family. Cooke Furniture has gone through painstaking trials, experiments, and focus groups to engineer fire pit tables for the purpose of dining around. Cooke Furniture has found that a height of 29”- 30” (Twenty Nine to Thirty Inches) is the ideal height for a fire pit table dining experience. In the Cooke Collection, the Mammoth and Bishop fire pit tables are the manifestation of the perfect engineering we have been speaking of. You can buy the Bishop and Mammoth Fire Pit Tables HERE. These tables were product designed and engineered from the ground up with the eating experience in mind from the beginning. As mentioned previously, the 29” – 30” height is used to create a table perfect for eating around. It is just low enough that you need to lean in a bit to eat your food. In-so-doing, this act forces you to engage with the other members at your table. The table is just high enough that it is perfect for eating your food from atop without having to strain much. With perfection baked into Cooke Furniture dining tables, they also lend to an ideal experience before and after the meal with the removable cover. The Cooke Furniture Fire Pit Table cover creates the option of having more room for meals that call for more plates. It is also removable for after the meal when you need less meal room and more room to look at the beautiful granite stone work. The Cooke Furniture Dining tables are truly suited to the perfect dining experience whether it is a short meal or a long drawn out meal that turns to hours of conversation with the people in your life that matter most. Cooke Furniture has made a science out of the perfect dining outside and has created a reproducible, perfect dining experience. The fire pit tables are so suited to the purest form of this age old dining experience, that you forget you are even at a table, but have been frozen in a moment in time that you never want to leave. Dinner around a Cooke Furniture Fire Pit Dining Table is the perfectly engineered vehicle for just that. Have you had an experience with one of our Cooke Furniture Dining Tables. like the one we have highlighted here today? Let us know in the comments.